Just like the main series, I was determined to finish the Malazan Empire this year but I may have to rethink that decision after my experience of reading this book. ARC provided by the publisher—Orbit—in exchange for an honest review. After the huge disappointment I had with House of Chains, Midnight Tides brought my love for Malazan Book of the Fallen back magnificently. I’m so tempted to frame this review as a letter to the book in question. Should I? Shouldn’t I? I think I should. Erikson started House of Chains, the fourth book in the Malazan Book of the Fallen series, in an unprecedented step. Unlike the previous three books, House of Chains started as a totally character-driven book that focuses solely on a completely new character, Karsa Orlong. This made for an awkward start because at first the story didn’t feel like reading the same series and Karsa took a while to warm up to due to his primitive and savage culture. 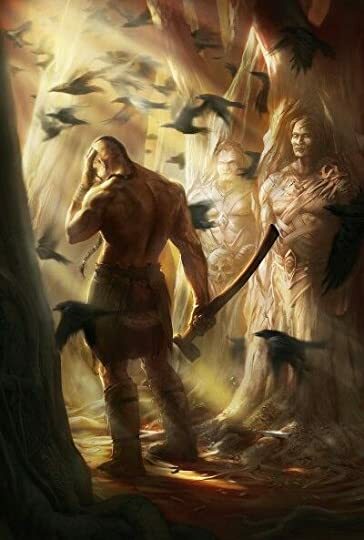 However, Karsa ended up being one of my favorite parts of the book because of his spectacular character development and how pivotal he became to the overall story. A peerless and jaw-dropping epic installment; I consider myself damn lucky to have witnessed this powerfully evocative tale.